If you’ve missed the innovative cooking of Richard Craven, after his restaurant The Chef’s Dozen closed, then here is some good news. After a short break, Richard is back! 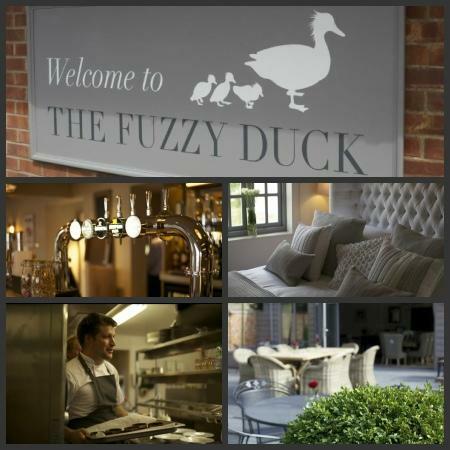 Richard is now head chef at the new country pub and boutique hotel The Fuzzy Duck. Nestled in the picturesque Warwickshire village of Armscote (a few miles south of Stratford-upon-Avon) The Fuzzy Duck building once housed the local blacksmith and in the 18th Century became a popular coaching inn. It remains Armscote’s only pub and has been given a stylish makeover by the family behind bath products brand Bayliss & Harding. Head Chef Richard says: “Our ethos is fresh, seasonal and local, with steak from Aubrey Allen and game shot to order by local game-keepers. We are creating local flavour combinations, such as Hay-smoked lamb with creamy mash, sea purslane and black olives and free-range chicken kiev with Herefordshire snails to excite our diners. To welcome 2013, here are my recommendations for five restaurants to celebrate New Year’s Eve. Check the Events page for details of a wine evening at The Chef’s Dozen, Coventry Farmers Market, The Big Picnic, Kenilworth Food Fayre, Alcester Food Festival and National Vegetarian Week.